Stewart R: Through all of the craziness that was Buzzkill and then The Paybacks, there ran sensitive, thoughtful looks at the human condition. Buzzkill took a hard look at the price of addiction, The Paybacks took a tongue-in-cheek look at the cost of doing good deeds and the corruption of authority. 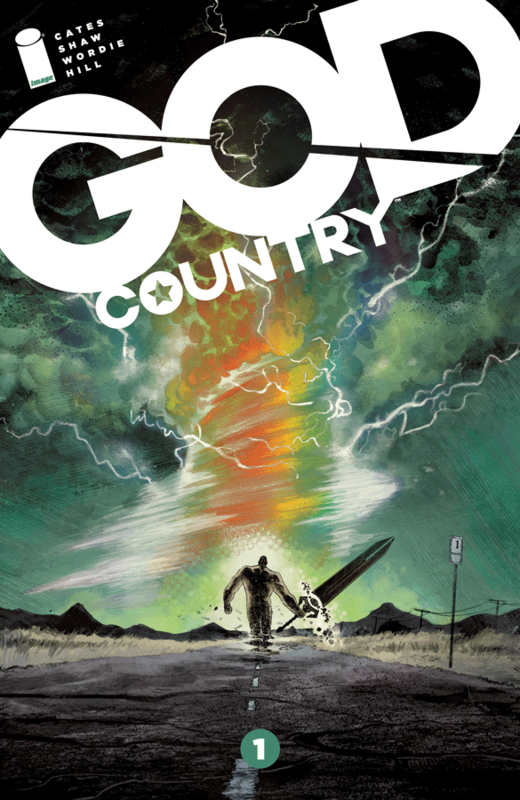 Now, wordsmith Donny Cates and pencil master Geoff Shaw have kicked off their new Image series God Country with a debut that feels calmer, slightly more grounded while still producing the crazy wonder and vibe of a fantasy comic. Stepping away from cityscapes and the cramped corners of civilization, we're coaxed into the wilder expanses of the Texan counties as Roy Quinlan has to cope with the pressures of family life and the heavy emotional yoke of his father, Emmett's worsening Alzheimer's disease. The early dialogue works well to show how both Roy and local law enforcement are struggling to deal with a condition that doesn't discriminate when it manifests and lashes out. The empathy from the Sheriff and Roy's denial of how bad things may get are well shadowed by Shaw's visual hinting at the 'monster' lurking within the house and Emmett's dwindling mind. He and colourist Wordie throw teasing panels into the mix, all shadows and menacing close ups, never capturing a full view of the elder Quinlan early on and the visuals remain more powerful for it. When things escalate, rather than focus directly on Emmett's threats, it's reflected in wider, younger, innocent eyes which makes the weary, resigned reaction that follows from Roy all the more telling. By the time the storm clouds of the fantasy plot really start to build and wreack havoc across the prairie, Cates' skills with the third party narration really come to the fore. 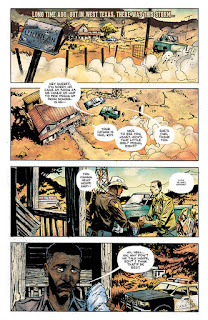 Cast in a southern drawl with all of the great dialect tics that come with the accent, it really adds to the atmosphere and general sense that what we're witnessing happened in the far distant past for the storyteller. Despite being gender-neutral, I found myself hearing Sam Elliot's famed voice delivering the lines in his gruff tones as I read through them. Once the storm of this debut strikes and then fades swiftly, it's the narration that hints of the epic and troubled times to come down the road for the Quinlans in delightfully teasing fashion.